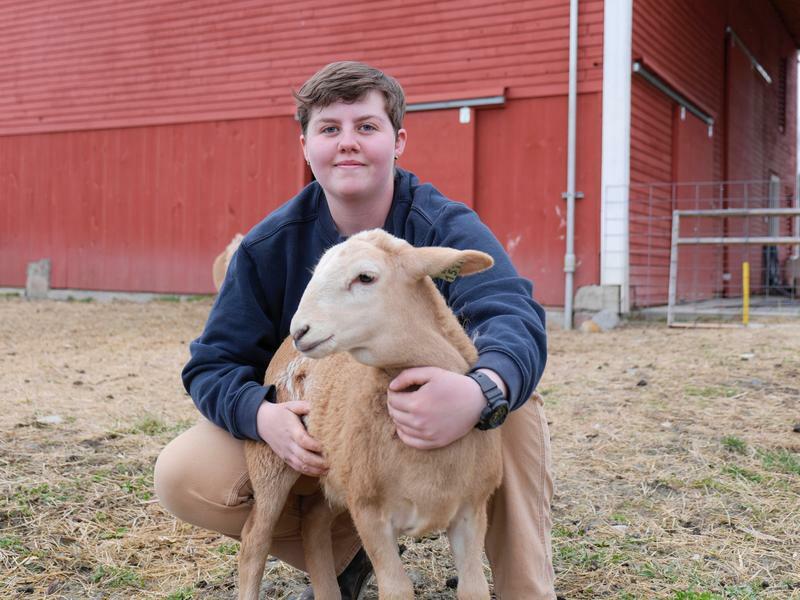 Spring is lamb season at Kennebec Valley Community College, and Abigial Smith hopes the animals will be part of her future someday. 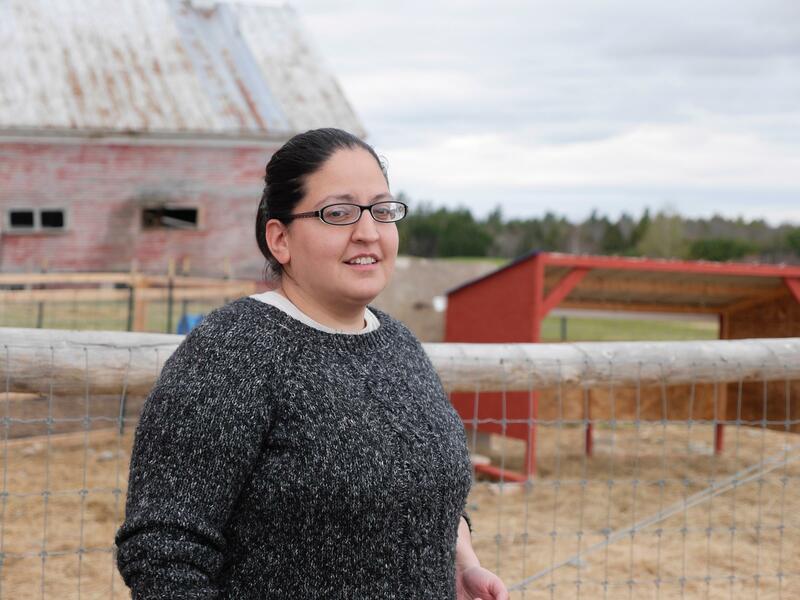 Smith will graduate this month from a three-year-old sustainable agriculture program at the college, where she has fallen in love with sheep working with the school’s 10 Katahdin ewes and lambs. These are just a few of the tenants on the school’s Hinckley campus, which also includes pigs and chickens and several acres of mixed organic crops. As part of her curriculum, Smith was able to test different crops for feed, build pens and get plenty of hands-on experience, something she enjoyed. Farm Manager Bo Dennis says students drive the operations here, so targeting student interest is key. “At the end of the day I’m the one that makes the decisions out here about how things move forward and how we do something, but it’s really including students every step of the way so that they’re understanding why we’re doing it a certain way and very open to their opinion as they learn the process,” he says. The program was developed in 2012 when KVCC officials, responding to a growing number of business closings in the region, got a $2.5 million federal grant through the Department of Labor. The money was enough to fund a companion program in culinary arts. Grant manager Elizabeth Fortin says both are part of a farm-to-table initiative that college officials hope will become a showpiece of the local food movement. “I would rather be happy knee deep in dirt than knee deep in money,” says student Kat Simpson. Simpson might have been that layperson. She came to KVCC thinking she’d major in business or computer technology. And then she got hooked — on farming. At 34, the New Sharon mother of two is completing her first year in the program. This summer she’ll complete a 120-hour internship requirement helping plant a new orchard at the farm. Simpson is not the only student who will take a more tangential path in agriculture. Wendy Leighton, a 2015 graduate from the agriculture program at KVCC, currently works for a garden designer in Bridgton. She says she realized traditional agriculture wasn’t for her. Instead, she hopes to grow willows commercially someday. Dennis says that’s the beauty of the program. Students connect to farming in different ways and there is always something new to try. “So farming is one of those jobs that never gets old because every day you do something different, and it is a job that can very much see the physical changes that you’re making. It’s very gratifying,” he says. Case in point: Smith, who graduates May 21, will spend the summer working with horses in Bar Harbor before beginning her hoped-for career with sheep.